Daniel Coit Gilman, the first president of Johns Hopkins University, believed that teaching and research are interdependent, that success in one depends on success in the other, and that a modern university must do both well. Johns Hopkins was the nation’s very first research university, and the realization of Gilman’s philosophy here, and at other institutions that later attracted Johns Hopkins–trained scholars, revolutionized higher education in America. Some of the earliest business-centered classes at Johns Hopkins challenged conventional wisdom from the beginning. For example, Henry L. Gantt—class of 1880 and inventor of the Gantt Chart—became a major figure in the scientific management movement, presenting innovative and often controversial ideas in his lectures at Johns Hopkins. In 1916, Johns Hopkins added business and engineering courses to a separate division of the university offering classes to part-time students. Energetic individuals such as Gantt fostered the growth of the new field of business administration and the concept of "working smarter" to enhance efficiency and profits. Following World War II, the Johns Hopkins program produced more CPAs than any other school in Maryland. The Master of Science in Management Science program became the first graduate level business degree at Johns Hopkins in 1961. It focused on the application of new findings in quantitative analysis and general systems theory. Over time, the program evolved into the management and economics-focused Master of Administrative Science program, graduating its first students in 1974. Enrollment in the program expanded rapidly. Ninety students completed the MAS program in 1979. By 1990, more than 400 students received MAS degrees. In 1991, the school developed new programs to address a business landscape undergoing unprecedented transformations thanks to technological innovation, emerging economies, and escalating politics. Johns Hopkins added the Master of Science in Business as well as Master of Science programs in Real Estate, Organization Development and Human Resources, Information and Telecommunication Systems for Business, Marketing, and Finance. Major changes in the late 1990s included the creation of a Master of Business Administration degree and the collaboration with other Johns Hopkins schools to offer Master’s/MBA programs in Medical Services Management, Biotechnology, Nursing, and Public Health. William P. Carey is a profound example of the mission and philosophy of the Johns Hopkins Carey Business School, and it is a legacy to be proud of and a part of. His values of responsibility, integrity, dedication and humanity define our mission. On December 4, 2006, Johns Hopkins University trustees, in response to a gift from businessman William Polk Carey, voted to establish a new business school dedicated to producing innovative leaders with broad, interdisciplinary knowledge. The school was named after his great-great-great grandfather, James Carey of Loudon, a successful Baltimore merchant during the 18th and 19th centuries. On January 1, 2007, the new Carey Business School opened its doors for the first time, guided by a simple yet essential mission: teach business with humanity in mind. 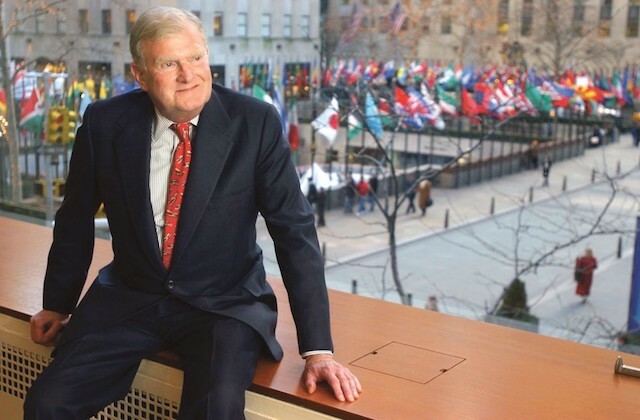 Mr. Carey's $50 million donation, paired with $50 million to be raised by the university, was responsible for launching the Carey Business School. This is the largest gift ever in support of business education at Johns Hopkins. The new school is named for his great-great-great grandfather, James Carey of Loudon, a prominent Baltimore businessman of the 18th and 19th centuries. 1916-1917: Evening Courses in Business Economics begin, although no degree in this field is offered until later. 1926-1927: Chi Chapter of Delta Sigma Pi (a business fraternity) moves to Hopkins during the Fall Semester of 1926 from the University Of Maryland School of Business Administration where it had been installed in 1922 – clear evidence that an undergraduate business program had existed at Hopkins at the time. 1953: The Department of Business Economics is disestablished, transferring its students from the Faculty of Philosophy (now the Krieger School of Arts and Sciences) to McCoy College and relocating the Chair of the Department of Business from Gilman Hall Room 318 to the basement of Shriver Hall. 1961-1962: A graduate degree with a focus on operations research is introduced –the Master of Science in Management Science—starting in the Fall Semester. 1964-1965: McCoy College is renamed the Evening College and Summer Session. The college is organized into five divisions: Administration and Business; Arts and Sciences; Education; Engineering and Physical Sciences, and Special Programs. 1971-1972: Students enroll in new Master of Administrative Science (MAS) degree during Fall Semester. 1984-1985: Evening College and Summer Session is renamed School of Continuing Studies. 1988: US News & World Report ranks the Hopkins MAS program as the third best regionally accredited business program in the eastern United States. 1991: The Berman Family’s generosity establishes the Allan L. Berman Institute of Real Estate Development and the launching of a part-time Master of Science in Real Estate degree. 1991-1992: Beginning during the Fall Semester of 1991, a Master of Science in Business (MSB) degree replaces the MAS. 1999-2000: MBA degree introduced during Fall Semester 1999. July 1, 1999: The School of Continuing Studies is renamed the School of Professional Studies in Business and Education. 1999: Johns Hopkins begins offering the MBA degree, which replaces the MSB degree. 2000: SPSBE launches the Master of Science in Finance. 2004-2005: Edward St. John’s generous gift establishes what would become the Edward St. John Real Estate Program and the establishment of a full-time Master of Science in Real Estate degree. December 5, 2006: Philanthropist William Polk Carey's W.P. Carey Foundation announces a gift of $50 million to Johns Hopkins to establish the Johns Hopkins Carey Business School. The school is named in memory of his great-great-great grandfather, James Carey of Loudon, a prominent Baltimore businessman of the 18th and 19th centuries. January 1, 2007: SPSBE separates into two new schools — the Carey Business School and the School of Education. 2008: Yash Gupta becomes the first Dean of the Carey Business School. 2010: Carey’s Baltimore campus moves from 100 North Charles Street to the Legg Mason Building in Baltimore’s Harbor East neighborhood, overlooking Baltimore’s thriving Inner Harbor. August 2011: Charter Executive MBA class arrives to begin its first of several bi-monthly residencies over the course of the 20-month program. May 2012: Charter Global MBA class graduates. July 2012: Bernard T. Ferrari, MD, JD, MBA, becomes the second dean of the Johns Hopkins Carey Business School, following Gupta’s departure. Dean Ferrari comes to Carey after a distinguished career in medicine and consulting. May 2013: Charter Executive MBA class graduates. August 2013: First full-time MS in Finance and MS in Marketing students arrive to begin their year-long programs. The Carey Business School expands its Baltimore and Washington, D.C. facilities to accommodate hundreds of the new MS students. August 2014: Charter MS in Finance and MS in Marketing full-time cohorts graduate in Baltimore. January 2015: Carey expands Flexible MBA degree program with the addition of online courses. February 2017: Earned initial accreditation from the Association to Advance Collegiate Schools of Business (AACSB). September 2018: Full-time MS in Finance becomes a STEM-designated program for 2019. MS in Business Analytics and Risk Management (formerly MS in Enterprise Risk Management) receives STEM-designation the following month. *Special thanks to former longtime Johns Hopkins business professor Dr. Peter B. Petersen for assistance in creating this timeline. More information on the history of business education at Johns Hopkins University can be found in his book, From Inkwell to Internet.